Windows Management Instrumentation (WMI) is one of the hidden treasures of Microsoft’s operating systems. Fortunately, SolarWinds have created a free WMI Monitor so that you can examine disk, memory and CPU performance information about your Windows servers. This freeware tool enables to you to measure the real-time performance of Microsoft servers including Exchange mailboxes and mail flow. There are two distinct strategies with this performance analysis tool, you could select an off-the-shelf SolarWinds monitor, or alternatively you could build an applet by choosing the WMI counters from the menus. Actually, there is a third way, visit the Thwack forum and download free templates that other enthusiasts have created. Your resulting WMI Monitor will deliver a desktop dashboard that monitors both local and networked Windows servers. See screenshot to the right. 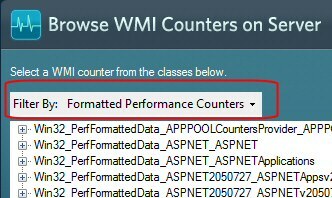 If you have ever flirted with performance monitoring, then you will find that this WMI analyzer takes the guess work out of selecting performance counters for applications like Microsoft Active Directory or SharePoint. Check real-time performance metrics on any Windows server or application. Appraise the application templates from WMI Monitor with Orion Application Performance Monitor if you need to monitor multiple applications or require more powerful monitoring. In my assessment, the WMI monitor freeware was average in terms of ease of setup. However, it does get the Guy seal of approval because you can install the monitor and get started without reading the instructions. The idea is that first you select your object, such as Memory, Processor, BIOS or Message queue; then you choose which counters to inspect. Alternatively, you can select a pre-defined template for Exchange or SQL. Where I was a bit slow on the uptake was realizing how to make changes to my WMI selections. The knack is to right-click the SolarWinds icon in the Navigation Area and select ‘Edit Configuration Settings’. See more about WMI in the Thwack forum. Develop a plan, what are the critical performance counters for your server? Memory, Disk, Processor or Mail Store. Take the trouble to register with the Thwack forum, not only will it give you first class support, but also it will provide a treasure of pre-defined settings called ‘Monitors’. 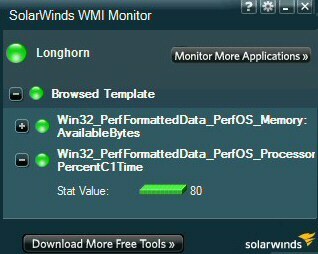 No appraisal of SolarWinds WMI monitor would be complete without a few words about WMI itself. To appreciate the beauty of a jewel, you should view the crystals from different angles. The same applies to the diamond that is Windows Management Instrumentation, I recommend that to gain perspective and understanding, examine WMI from these angles. Think of WMI as a database holding information about a computer’s disk, services, processor and objects. View WMI as a pipe connecting magically to the inner secrets of the Microsoft operating system. Get a good WMI monitor to probe, and to measure the operating system’s properties. Appraise this freeware gadget in action on this YouTube clip. I found the hardest part of installing this gadget was remembering where I downloaded the zip file! Once I found the executable it was all downhill the rest of the way. I extracted the .msi file, clicked on the licence agreement, and then let the install wizard complete the setup. After your evaluation, should you need to uninstall, then go to the Control Panel, Programs, scroll down to ‘S’ for SolarWinds Wake-on-Lan. It’s a sign of a good freeware program that it uninstalls easily and completely. To review more ideas for WMI monitoring visit the Thwack forum. There is no escaping acronyms. Guy’s 3rd law of computing says, the more acronyms that you see on a page, the greater the degree of difficulty you are about to encounter. Yet knowledge is power. Until you understand what an acronym means you feel intimidated, rather like an outsider to a clique. However, once you get a feel of what the letters stand for, then you can join the club and savour the power of those capital letters – WMI (Windows Management Instrumentation. To me, all acronyms have a personality, WMI is like a no-nonsense inspector and in fact, WMI reminds me of an HMI. In England, an HMI is better known as a school inspector. Imagine that I made a mistake and addressed WMI as Windows Management Information, I half expect that it would sharply correct me and say, ‘Actually, I’m Windows Management Instrumentation‘. Thus WMI is all about retrieving information about what is going on, all the way from the hardware to the operating system’s services. The Windows WMI monitor will help you get started because it specializes in displaying performance monitor counters, for example, Memory: Available MB, or Processor: Interrupts PerSec. Remember the Thwack community will help by answering your questions, and by providing templates with pre-defined counters that other administrators have found useful for their servers. Evaluate other WMI Performance Monitors. Whenever I think about WMI for any length of time, it hits me: the operating system must know everything that’s going on! All we need is a microscope to view the same data. Well, with this WMI tool you can see real-time performance metrics on any Windows server. What makes this freeware monitor above average is the large selection of pre-built and community generated application templates.